My first son is a great eater. My second son is pickier. Why the difference? My eldest was always in the normal range for weight and so when he refused to eat something I served, I’d tell him, “If you don’t like it, you don’t have to eat it, but I’m not making anything else.” So it didn’t matter if he ate or not. So he ended up eating because he knew I was serious. We continue to serve foods that we don’t think he’ll eat. Daniel sees me put peanut-fried noodles with tofu on the table. He sees what the family eats even if he doesn’t want it. 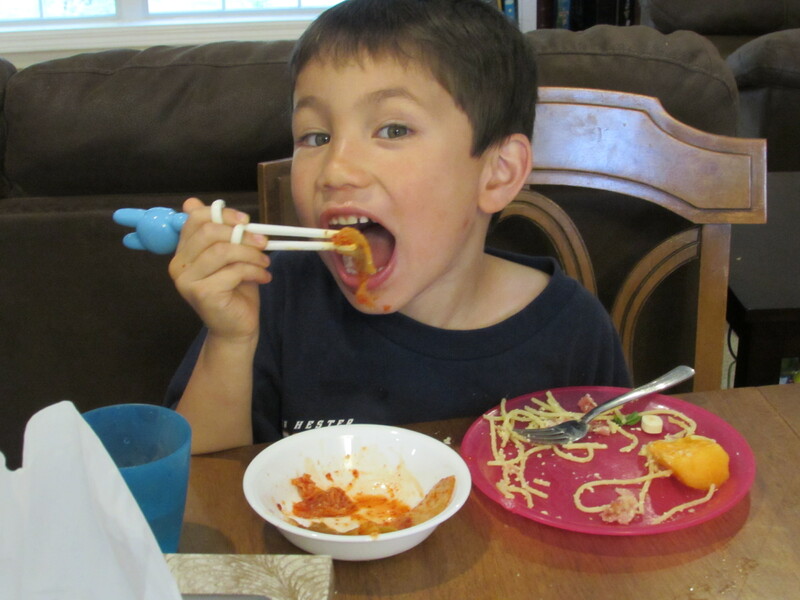 Daniel has to be okay with different foods on his plate, just like the rest of the family. He doesn’t have to eat it, but it’s on his plate. If licking a food seems to be too much for your picky eater, see if he/she will touch it with their fingers. If they say no, ask them to pick it up and toss it in the garbage. Any interaction with the food desensitizes your child from worrying about the food in the future. My toddler loves it when food talks to him. We also make foods walk around. It looks ridiculous but it makes eating pleasurable instead of a battleground. In an effort to get your child to be willing to eat something new, consider touching food with something else. That way there’s a barrier between the child and the “weird” new food, but they are still interacting with it. My younger kid loves to eat while we prepare foods. He might not eat the final product, but he’ll nibble as we cook together. If you’ve never cooked with your kids, I’d try baking something from a mix first. It’s hard to screw it up. It’s fun to stir and see what happens! Both of my sons went through periods of thinking something was awesome and then it wasn’t. For my older son it was avocado. For months he couldn’t get enough of it and, then out of the blue, he refused it for seven months. One day he decided to try it again and we were back to normal. It’s maddening! My toddler eats three times as much at a restaurant. He loves white rice so we take him to a pita place that serves yellow rice. It expands his repertoire by letting him eat a preferred food that just a bit different. He’ll try some chicken shwarma sometimes too! Get out a big Tupperware and put dried beans and/or rice in there. Then get little trucks or measuring cups and spoons and have your child play. Children who are picky are often less willing to experiments new sensory experiences. My younger one hated sand when he first felt it on his feet at the beach, but by day two he was fine. Lack of exposure to different textures can be an issue. Try snow and sand too! I put on my speech path hat to give you the suggestions above, but consider talking to your doctor if your child’s preferences decrease to a small subset of foods. For example, if your child accepts only 10-15 foods or less, you may have a feeding disorder on your hands. Feeding therapy (from a speech path or occupational therapist) can make a difference. If your child eats all fruits and hot dogs, hamburgers, and chicken nuggets, that’s probably not a feeding disorder (more than 15 foods). I would be concerned if a child ate only grapes, watermelon, milk, only McDonalds nuggets and fries, yogurt, certain crackers, and they are getting worse. That could be a feeding disorder. If in doubt, talk to your doctor.